Our Staging Boards are manufactured in the UK and are have the British Kitemark BS2037 Class 1 for industrial or trade use. Featuring non slip marine plywood with strengthening cross struts and heavy duty rubber end caps these staging boards are the strongest in the UK. Perfect for low level work, they cover a much larger area compared to ladders saving vital time on the job. Inclusive free next day delivery on top of an unbeatable price - beware of "hidden" delivery charges or slow 2,3,4 or even 5 day delivery times! Fully certified and tested by BSI (British Standards Institute) to BS2037 (Class 1 Industrial Duty) - These staging boards carry the illustrious British Kitemark meaning they have passed the most rigorous and strenuous tests for your peace of mind. Extremely strong - Maximum safe working load of 270kg (42 stones) evenly distributed - This is the equivalent of two or three decorators and their tins of paint and brushes. 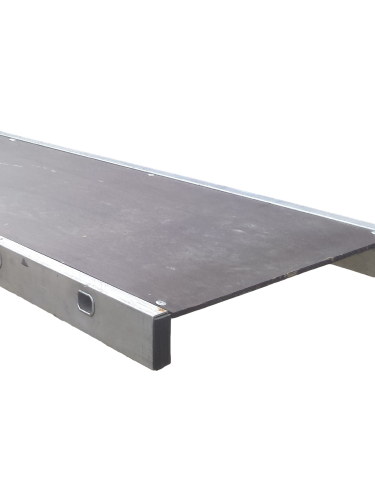 Non-slip marine grade plywood platform for your safety and sure footing. Plywood also has sealed edges to prevent water damage. Manufactured from aluminium - meaning they will not rust. Staging boards have many uses including brick laying, painting & decorating, hedge cutting etc. 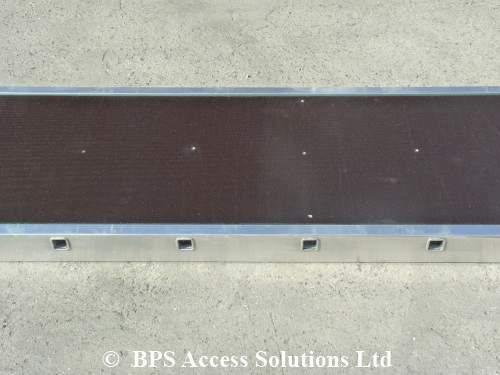 Heavy duty rubber caps are fitted to the ends of the staging boards to protect the aluminium stiles when in use and being transported. These caps also protect the board from water and insects getting into the stiles when they are in storage. When painting the outside of a building, staging boards enable you to cover a much wider area when compared to using a ladder, allowing you to complete a decorating job much faster. This same principal applies with hedge cutting. To meet the latest health and safety standards the staging boards should be used in conjunction with a Handrail system. Handrail brackets for these are available as an extra. Manufactured in the UK and certified to the BS2037 (Class 1) industrial standard, for your peace of mind. Massive weight rating of 270kg! We only sell top quality staging and have carefully selected this range of products so you can be sure you are buying the best! Cheap alternatives are manufactured from weaker materials and not certified. Much lower weight rating and less durable. Great value, top of the range, staging boards that offer the best combination of quality and value for money. Our customers love these, as evidenced in the many FIVE STAR reviews from our independent survey. Very few, if any, other retailers offer this great value in what is a superbly constructed product. We are the UK Access Equipment Experts! Massive stocks always held for next day delivery, all backed up by our knowledgeable sales teams and celebrated aftersales service. Check out the superb customer reviews received through the independent agency FEEFO. We are open 7 days a week (weekdays until 9pm) to provide product advice and take your order. We also trade through multiple channels so you can make a purchase 24/7. Our telephone lines are NOT charged at a premium. No other companies come close to us on customer service – some even “invent” their own customer reviews or “cherry pick” and have a limited number so you cannot get a real indication of what service you can expect. Advice available during limited hours only and definitely not at weekends. Manufacturer in the UK and certified to the latest BS2037 (Class 1) industrial standard – for your peace of mind. Supplied with non-slip, marine grade plywood surface for optimal grip when using. 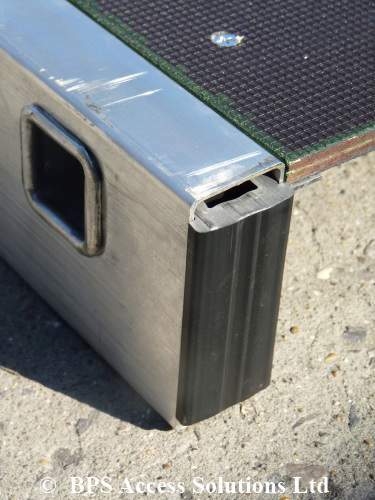 The boards have heavy duty support struts underneath to ensure there is very little bounce along with rubber strips on the underside of the stiles, preventing the staging board from slipping. Some of our competitors sacrifice safety for a cheaper build quality – something we will never do. Very little support underneath the board, means there is excessive bounce when walking across. Moreover, no rubber strips mean the staging board is susceptible to sliding around. Both of these issues make the staging significantly less stable. We offer the best prices available which include FREE NEXT DAY delivery to most of the UK Mainland (small charge will apply to the Scottish Highlands and UK Islands). We buy in bulk! and in doing so can command the very best prices which we are able to pass onto you, our customers. We will not be beaten on price. We can’t find a competitor who supplies Staging, of this quality, at anywhere near our prices. If you do, please let us know as we refuse to be beaten on price! Others charge for delivery or it will take up to 5 working days to reach you. Forever Guaranteed – We offer a no quibble Lifetime Guarantee on our products – in the unlikely event that problems are experienced, we will either repair or replace the affected part/product. We are a UK owned and based company who have been trading for many years, so this peace of mind is definitely worth having. Not lifetime guaranteed or offered by companies who have been trading for a relatively short period of time – probably not worth much in the event of a problem. User guidance provided. You also have the reassurance of being able to speak to one of the experts in our Customers Services Team if further assistance is required. No guidance on best way to use them. No support teams to help with an queries. 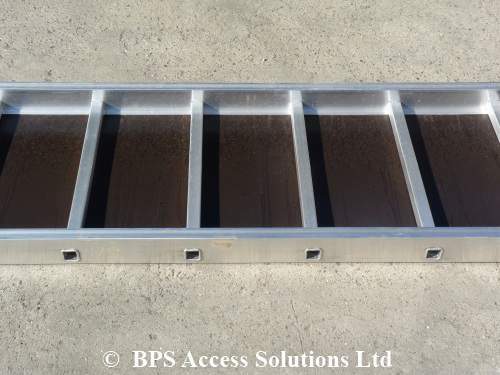 Manufactured from Aluminium, meaning they will not rust – can therefore be stored outside if needed. Rubber caps fitted to end of staging boards to protect them from damage whilst transporting. Discounted handrail brackets available to purchase at the same time – no need to spend time trying to find non genuine, compatible parts. Extensive range of sizes available. No handrail brackets available, meaning you need to source from elsewhere. Only stock a limited range of sizes. Orders placed before 4.00pm Monday to Friday will be dispatched same day for next working day delivery to UK addresses. Orders placed after 4.00pm will be treated, for the purposes of delivery, as having been placed the next working day. Working days are defined as Monday – Friday (excluding bank and public holidays) – therefore any orders placed after 4.00pm on Friday will not be processed until Monday. Our Staging Boards have the British Kitemark and are certified to BSEN 2037 Class 1.